Blunt nose, flat top, tacky grip; just about everything I love in the feel of a putter! This disc feels excellent in the tacky XT plastic and releases quite easily. And holy cow, this putter does not glide! Despite knowing the glide rating of 1, I was still caught off guard by how little glide the Bullfrog has. That’s a good thing though, it provides an awful lot of control and consistency. The stamp is a little odd, a frog riding a bull (which Joe from the Disc Golf Podcast points out is a frog on a bull, not actually a bullfrog). But the artwork is well done. 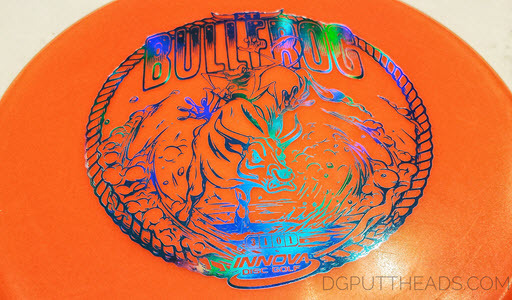 Also, despite a similar sounding name, the Innova Bullfrog is nothing like the Innova Bulldog. The Bullfrog putts pretty much like you’d expect a low glide putter to putt. It takes a little extra effort to get to the chains, but it’s incredibly consistent. When putting, the Bullfrog feels like a 0 turn and 2 fade putter; it drops consistently and predictably but not extremely hard. One huge advantage to low glide putters is that they are less affected by the wind, and the Bullfrog holds up to this expectation. Some low glide putters are very overstable, but the Bullfrog is moderately overstable. This allows for greater versatility than a lot of other low glide putters. 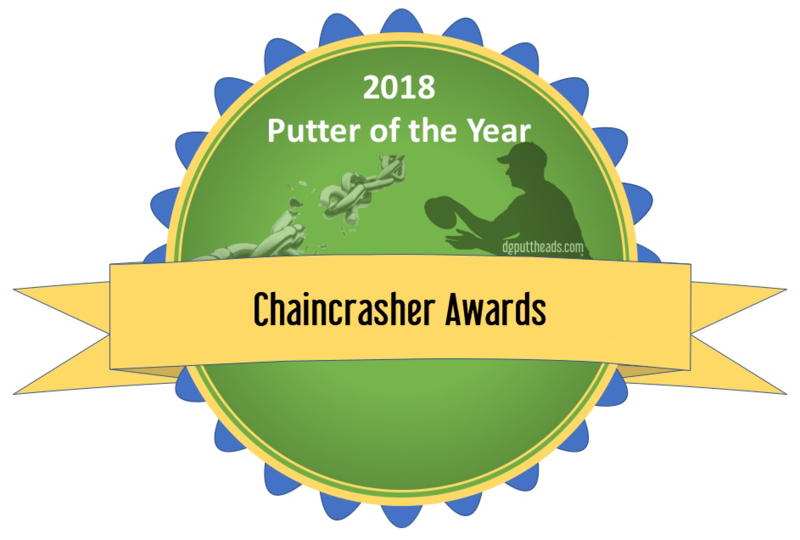 I was able to putt with any style I tried and found a lot of success with turbo putts. The Bullfrog will even handle a decent anhyzer line outside of the circle. Just recall that it’s a little more difficult to reach the basket from 80 feet out with a putter like the Bullfrog. Innova’s Bullfrog is and excellent all-around driving and approach putter. You’ll have to remember that it’s slow and low-glide so it won’t fly as far as other putters, but it’s controllable and consistent with a smooth release. I find I have a difficult time throwing the Bullfrog beyond 200ft (60 meters). When driving, the Bullfrog performs like at 0 turn and 1 fade that drops out of the air early but doesn’t dump hard to the side. This provides great accuracy! The Bullfrog doesn’t skip or slide much and it only rarely rolled away from its landing spot. The Bullfrog is very straight and only turns when I tell it to or when thrown into a headwind. When released on a hyzer it will hold the line unless thrown full power when it may flip up just a touch. 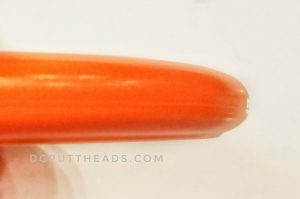 It will actually hold an anhyzer line for a decent flight and pull out just a little, but the anhyzer line is a little shallower than usual due to the low glide. One great feature of the Bullfrog is that releasing it slightly nose up will actually give it more glide while maintaining its normal flight path. This comes in handy for slightly longer approaches or shots where you need a little extra side to side movement. Check out our stall putting article if you want to get real fancy with it! Even in a headwind it resists a hard turn and will usually provide a late slow turn. 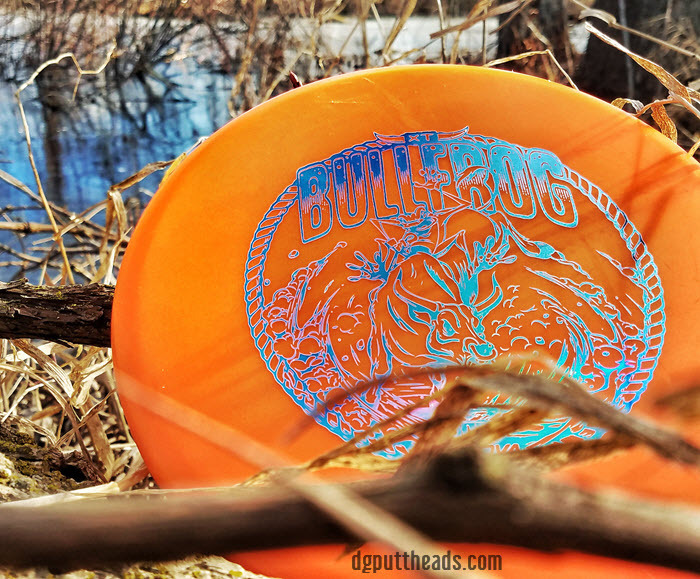 The Bullfrog’s low glide makes it a great wind disc. It performed remarkably well in steady 7mph winds. 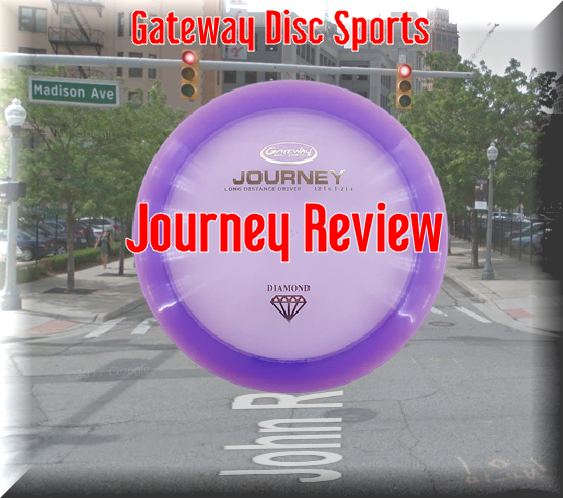 Because of this it should become the go-to approach disc for many disc golfers. Latitude 64 Caltrop: Bullfrog has even less glide and handles a little more torque. Kastaplast Berg: A lot of similarities but Berg is puddle top and more overstable. 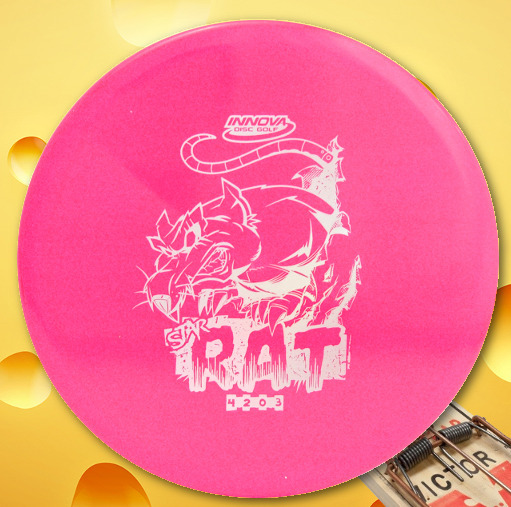 Reptilian Disc Golf Scale: Similar glide, Scale is more overstable and harder plastic. Kastaplast Reko: Reko has a rounder nose and may turn slightly more. 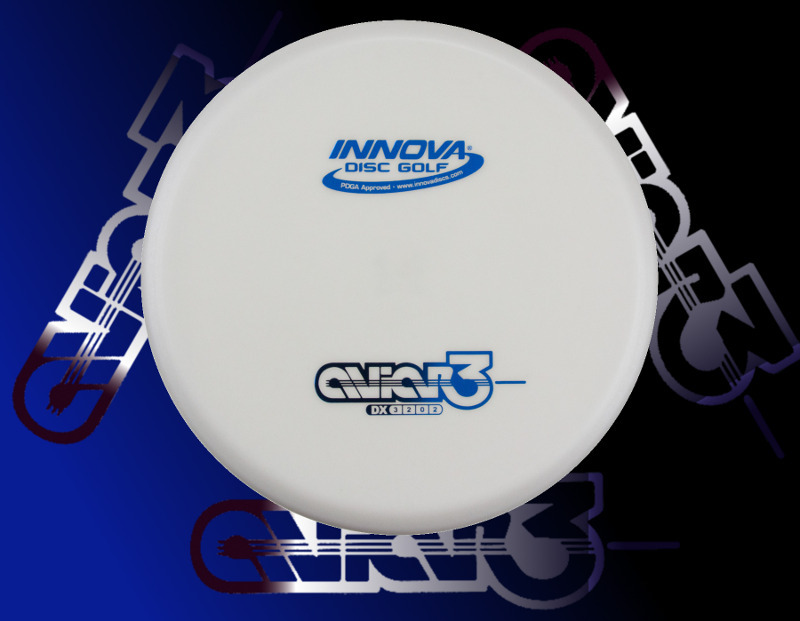 Innova has molded an excellent low-glide putter. This is what I had hoped the Caltrop would be, low glide and straight, controllable and versatile. 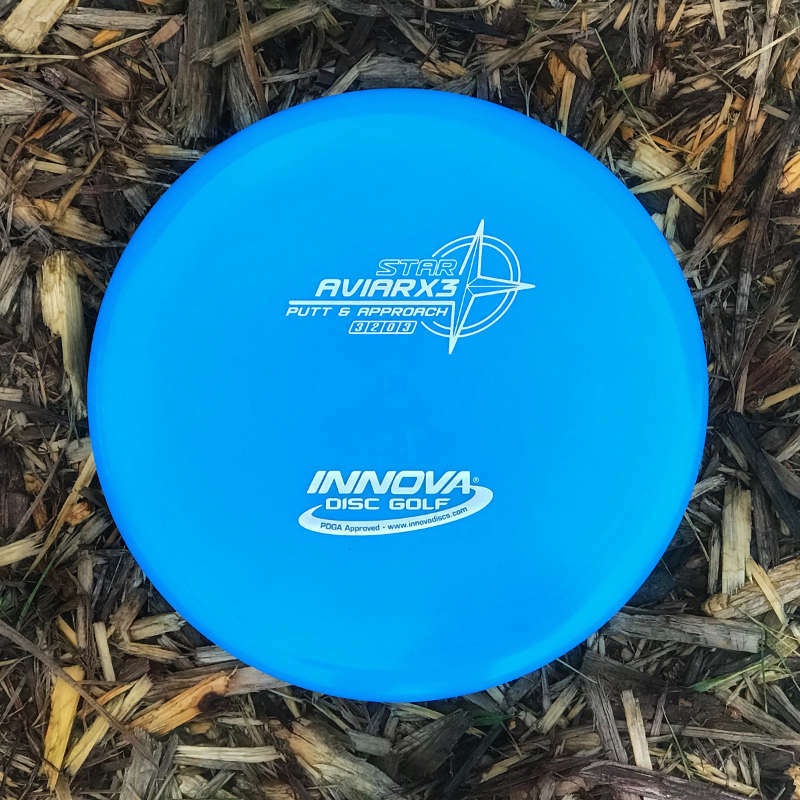 I wouldn’t consider this a beginner disc due to the low glide, but more advanced players should love this disc (unless you don’t like low glide, in which case stick with an AviarX3). Very few low glide discs release this smoothly. You should give this froggy a try. Are you ready to throw your own Bullfrog? Find your Bullfrog here!